Hot cross buns are a staple in the Scullery this time of year so we thought we’d share our recipe in case you’d like to try to bake some this weekend! 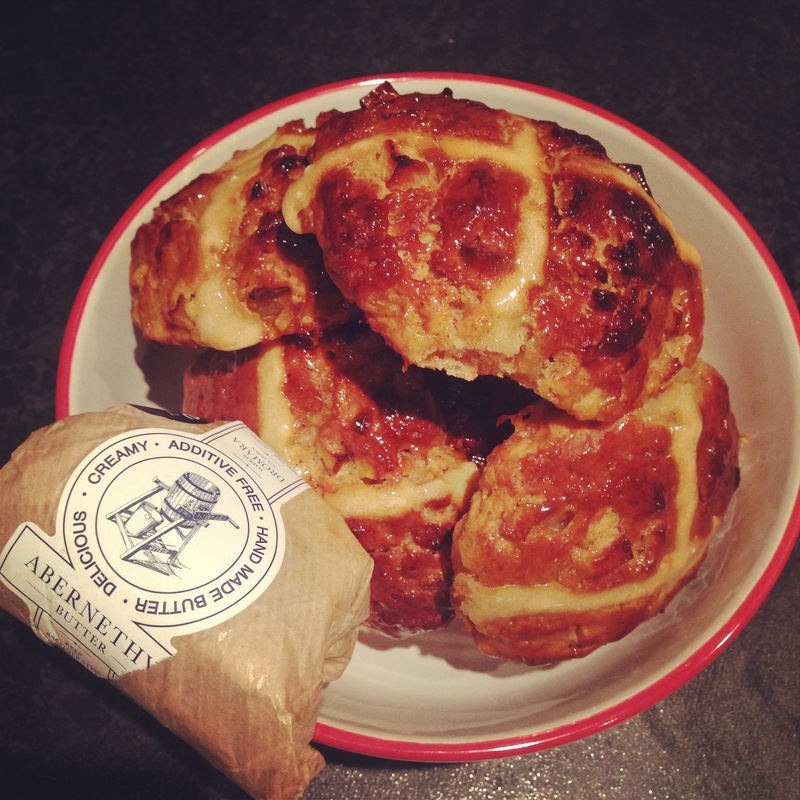 These soft, doughy Easter buns are traditionally baked with rasins, currents and citrus peel and seasoned with cinnamon and nutmeg but we thought we’d use local Armagh Bramley apples instead of dried fruit and peel because these Orchard County apples pair perfectly with the warm spices used in Hot Cross Buns. Armagh Bramley Apples have Protected Geographical Indication status (like Parma Ham and Champagne) giving recognition to the unique environment they’re grown in and the distinctive flavour they have as a result. These Bramleys have a much tarter flavour than Bramleys grown in other regions but when cooked with gentle heat and a dollop of Abernethy butter the apples lose some of their acidity and offer a more mellow apple flavour with a hint of tartness through the bun. Bramley apples are widely available through supermarket chains but for Armagh Bramley apples you’re best checking for the sticker below or asking your local fruit & vege shop or looking at Farmer’s Markets around the country! Cover the apple peel in Burren Bramley Balsamic and cook @180oC for 20 minutes to dehydrate and brown the peel slightly. Finely chop the peel once cooked. Cook the diced apple on a medium heat with 20g brown sugar and 20g Abernethy butter for 8-10 mins. To prepare the dough, mix the flour, salt, sugar, spices, yeast, cooked apple and peel in a large bowl. Gently melt the butter, add the milk, egg and water and mix well (use warm water if the temperature of the mixture feels cold to touch). Gradually add the liquid into the dry ingredients and mix well to form a dough. Seal the dough bowl with cling film and leave in a warm place for a min. of 1 hr to rise. Divide the dough into 9 round pieces and place on an oven-proof tray lined with baking paper. Cover the dough with an oiled piece of cling film and leave in a warm place for 30 mins to rise. Prepare the paste for the crosses by mixing the flour with water, one teaspoon at a time to form a thick paste and pour into a piping bag. 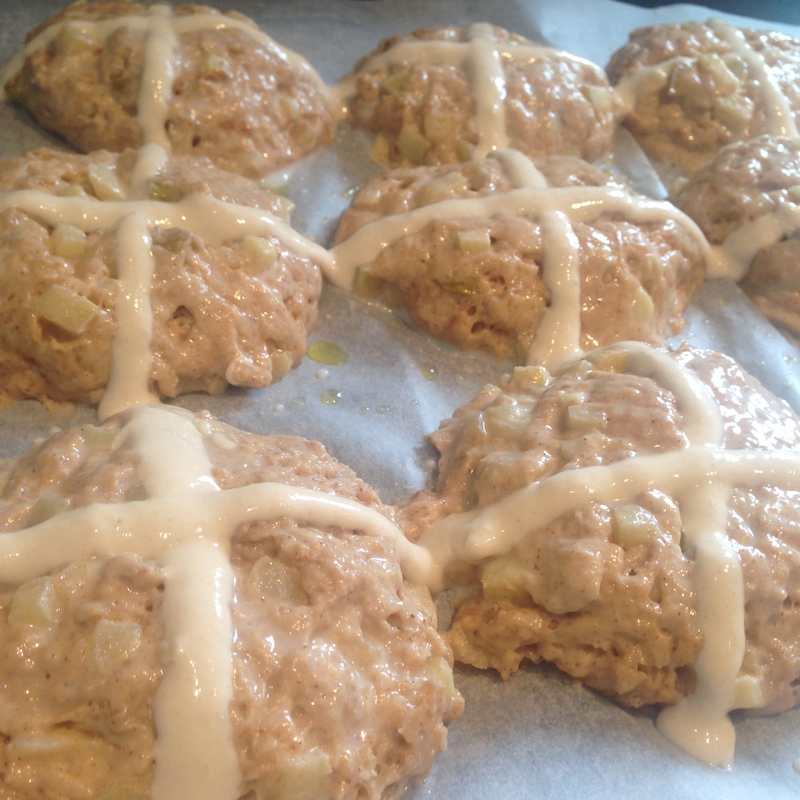 Wash the dough with milk and pipe the crosses before baking in the oven for 25 mins @180oC. While the buns are baking, prepare the glaze by boiling the apple juice and sugar to melt the sugar and reduce the liquid to a syrup. When the buns are baked, wash with the glaze to finish. Happy Easter & we hope you enjoy your hot cross buns, chocolate eggs and juicy Irish lamb this Sunday! !